This coming year will be the 25th anniversary of the Vidyadhara Chögyam Trungpa Rinpoche’s parinirvana. Commemorations of this will include a variety of activities related to our work. 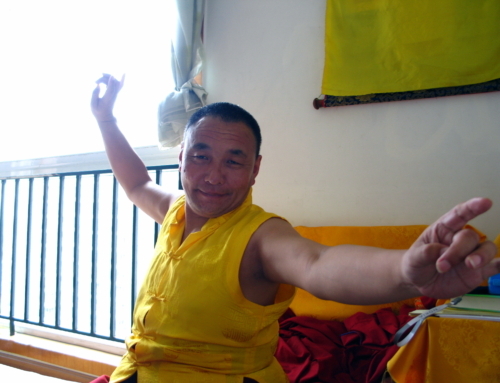 Sakyong Mipham Rinpoche plans to offer the Sadhana of Mahamudra abhisheka, which he has not conferred for several years. We plan to help with the teachings that accompany it. We are reviewing the manuscript for the vajrayana volume of The Profound Treasure of the Ocean of Dharma, the monumental edited compilation of thirteen years of the Vidyadhara’s teachings at the Vajradhatu Seminary, due to be published next year. We will complete our work on translating and reproducing the hundreds of notecards written by the Vidyadhara for his talks, which will be published along with the complete transcripts on DVD by Shambhala Media. Long ago we identified the importance of translating the Vidyadhara’s teachings in English into Tibetan, especially for the benefit of his continued presence at Surmang Monastery and elsewhere among the Tibetan community. It is a daunting task and requires highly literate, well-studied native Tibetan translators and writers. Karma Senge Rinpoche and Chökyi Senge Rinpoche, the twelfth Trungpa, have now requested our help and consultation in this effort. 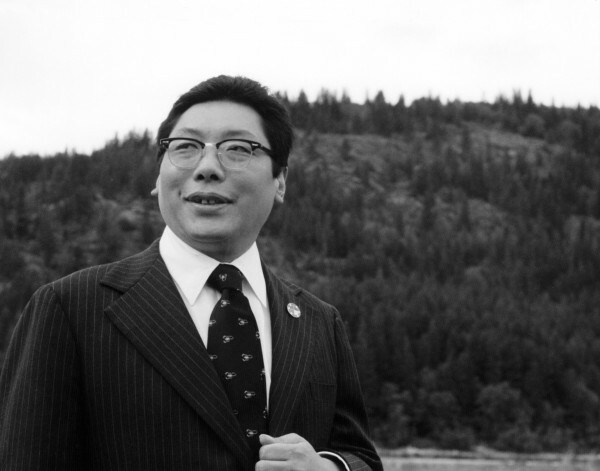 Karma Senge Rinpoche and the twelfth Trungpa Tulku Chökyi Senge have requested that the elventh Trungpa Rinpoche’s English teachings be translated into Tibetan. The ngöndro liturgy for the Vidyadhara’s termas did not include verses for contemplating the “four reminders,” an essential component of ngöndro practice. Karma Senge Rinpoche considered using sections from other Tibetan compositions by the Vidyadhara for this. But in the end, he favored using the four short, pithy verses the Vidyadhara composed in english in 1974, for his students who were beginning to practice ngöndro in the context of the first “tantra group” in Boulder. Khenpo Tsering worked hard to translate these into Tibetan, attempting to capture both their meaning and spirit of directness. Karma Senge Rinpoche and the Committee reviewed, refined, and discussed this with him in detail on May 7. We think this was an historic and auspicious beginning. 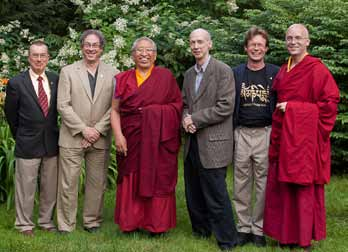 Thrangu Rinpoche & Karma Choephel with Translation Committee, August 2011. And in August, the Venerable Thrangu Rinpoche helped us complete these! Soon after our return home, we learned that Dzongsar Jamyang Khyentse Rinpoche had encouraged two of his students to translate Meditation in Action into Tibetan. Two chapters have been completed, and they hope to finish by year’s end. Thrangu Rinpoche answering our questions. In August, the Venerable Khenchen Thrangu Rinpoche taught Khenpo Gangshar’s Naturally Liberating Whatever you Meet in Halifax. He was very kind to meet with us and go over the translation of Karma Senge Rinpoche’s commentary for the Vidyadhara’s ngöndro. As always, we are ever grateful to Thrangu Rinpoche for his vast wisdom and kindness. 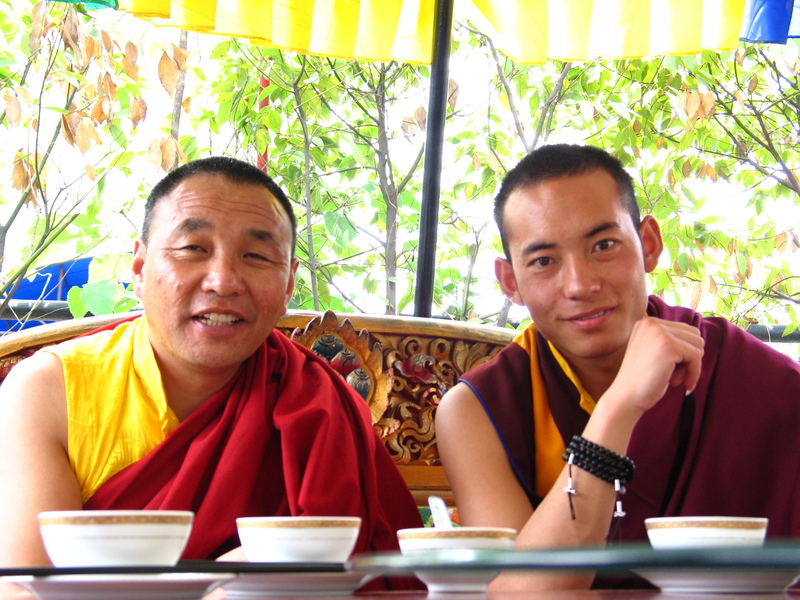 Much to our joyful embarrassment, Rinpoche offered us, and all translators, a tenminute praise of dharma translation, which we have posted here. The Collected Vajra Liturgies is now available here. As we reported in last year’s newsletter, we completed a significantly revised edition of our daily chant book in the late fall, now entitled Collected Vajra Liturgies, which includes thirteen new chants and several revised translations, both of which are available separately. This summer we published a new edition of the set of additional vajrayana chants, two of which include revisions. Please see our website for more information. 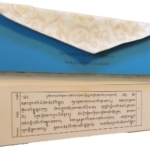 The new Shambhala Chant Book, is intended for public programs and was just published this summer, including a special shrine-room edition for our centers, making this more elegant and uniform throughout the community. Next year we will issue a new edition of the Warrior Chant Book, used at Warrior Assemblies. 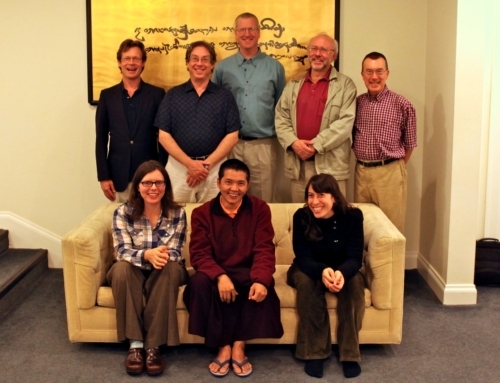 We moved into the realm of Tibetan text publishing over the last year. The Werma Sadhana in Tibetan. We produced a digitally typeset edition of the Werma Sadhana and commissioned white brocade text covers, suitable for our Shambhala shrines. 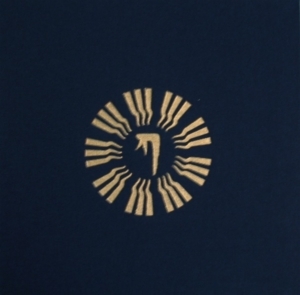 We also reprinted a beautiful two-color limited edition of the The Sadhana of Mahamudra, calligraphed by Lama ugyen Shenpen as an expression of his devotion during the Vidyadhara’s final illness. We also published a new digitally typeset edition, which includes some minor corrections to the Tibetan, recently approved by Karma Senge Rinpoche. Both have elegant red brocade covers. The Activity of Blessings: The Practice of Guru-Protector Dorje Dradul Second Edition can be ordered from Shambhala Media. We helped to edit and typeset a new edition of The Activity of Blessings: The Practice of Guru-Protector Dorje Dradül composed by the Sakyong, which includes a very interesting essay on “The Thirteen Dralas of Tibet,” commissioned by the Dorje Kasung from Committee member Robin Kornman, who wrote it shortly before his untimely death. This essay is now on our website under the “offerings” section. This fall, we plan to publish a series of talks on The Sadhana of Mahamudra given by Changling Rinpoche during his visit to Halifax last year. This last year the Buddhist community, and especially its translators, suffered the loss of a great bodhisattva and friend, E. Gene Smith, who was a renown Tibetologist, librarian, and archivist. He single-handedly saved many, many Tibetan texts from annihilation, and made them available to us all. 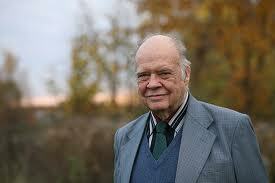 We all miss this great man to whom we are so deeply indebted. Larry represented Shambhala and the Committee at Gene’s memorial service in New York City this last winter. for more about his incredible life and accomplishments, please see: www.tbrc.org. In the vein of our Translators’ Teas, this summer we shared our stories with “An Evening with the Nalanda Translation Committee” in Halifax. Larry also presented this at a Werma feast in Vancouver and in Akron and Montreal. Scott and Jessie presented this in Bellingham. If any of us are traveling in your area, we would be happy to offer this to your sangha. Last october, Larry conducted a Sukhavati ceremony for Lady Beattie Beverley Webster, a very dear friend and champion of the Committee since its inception. Beverley helped us to establish the Vidyadhara’s Tibetan library and was instrumental in fostering our work with him during her many years as his secretary in Boulder. Beverley was a supreme dharma lady and a pillar of our community. She is missed. Last fall, Larry taught his first online class for Vajrayogini sadhakas. At the great Stupa. In the winter, Larry led a Chakrasamvara retreat at Dorje Denma Ling. He returned to the Great Stupa at Shambhala Mountain Center for a Vajrayogini intensive just before the acharya retreat there. He gave a series of talks at the Vancouver Shambhala Centre, and soon after taught The Sadhana of Mahamudra at a weekend in Akron. Scott participated in the “Rebel Buddha: on the Road to freedom” book tour, joining Dzogchen Pönlop Rinpoche, Barry Boyce, Tyler Dewar, and Carolyn Gimian on the Halifax panel. He taught a course on the modes of engagement of mind according to the pramana tradition in Halifax over the winter, and courses on valid cognition and the hinayana view at the Nitartha summer session in Bellingham. In January, he participated in an organizing conference for the Common Buddhist Text project, a joint effort of the united Nations, the Royal Thai government, and translators from the Theravada, mahayana, and vajrayana traditions to create a common set of scriptures representing the range of Buddhist traditions. While in Thailand for the conference, he gave a talk at the Bangkok Shambhala Center on the Vidyadhara’s early training under Khenpo Gangshar. In Halifax, along with Andy Karr and others, he helps lead a weekly contemplation class, and also continues to teach a group of aspiring translators, both young and not-so-young. He attended Marpa foundation board meetings with Khenpo Tsültrim Gyamtso Rinpoche in Kathmandu, who was in excellent spirits. Mark continues to lead weekend Vajrayogini fire offerings at Dorje Denma Ling, focusing on enriching and magnetizing. He also presented our slide show in Washington D.C., and has recently been giving public talks in Halifax. Patricia prepared The Rinchen Terdzö empowerment Record, a list of almost 900 empowerments for sakyong mipham rinpoche in 2009. she provided this to Venerable Gyatrul Rinpoche’s sangha, orgyen Dorje Den, who hosted Venerable Yangthang Rinpoche when he bestowed the Rinchen Terdzö in California this winter. The planners and participants found this to be very helpful. Jessie translated for Namkha Drimed Rinpoche during a cleansing ceremony in Halifax last fall. This summer she attended the Kalachakra for World Peace led by His Holiness the Dalai Lama, and attended by His Holiness Karmapa, in Washington D.C. After that, she taught literary and colloquial Tibetan, and translated for Acharya Lama Tenpa Gyaltsen’s course on buddha nature at Nitartha’s summer institute. The latter used the Committee’s translation of Mipham’s The Lion’s Roar: The great essential exposition on enlightened Nature. Walker spent most of the winter and spring working on a new book about the Rinchen Terdzö, The Golden Mirror of Wisdom, which is available at lulu.com. He is taking this year off from Committee translation work to focus on writing and other projects, including marrying Committee member Patricia Kirigin.